Was the Battle of Barnet also in the wrong spot? The recent discovery of the actual site of the Battle of Bosworth made headlines around the world. It now seems that we might also have to rethink the location of the Battle of Barnet. The Battle of Barnet was fought on Easter Sunday, 14 April 1471, between Edward IV, who had returned from exile in Burgundy, and the Yorkists on the one side, and the Earl of Warwick and the Lancastrians on the other. This was the first battle in which the then 18 year-old Richard, Duke of Gloucester, fought and some think that he commanded the vanguard. Visibility was greatly reduced due to a thick mist. This mist seems to have lasted until the present, because the exact location of the site is still being disputed. The reason is that so far no archaeological evidence has been found, possibly because researchers were looking at the wrong spot and had concentrated on the registered site in Hadley Green. 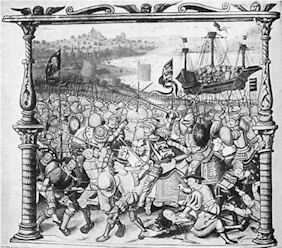 Picture of the battle from an original manuscript of Philippe de Commynes. Either he is not too sure of the geography of England or the coastline with the boat in the background alludes to Edward’s return across the sea from Burgundy. A more probable location is approx. one mile further north near Kitts End. This is based on re-examination of the evidence for the historic terrain, of the battle accounts, and the important research by Brian Warren into the place where the chapel to the dead was constructed after the battle. Alongside this chapel lead shot has been found by a local resident. Mr Warren has also shown that in the 15th century the boundaries of Barnet extended much further north than previously thought. The Battlefields Trust, which also investigated the new site for the Battle of Bosworth, is launching an appeal to raise money for an archaeological survey of the suggested area. It is also asking residents to report any finds from the area which may have come from the battle, even if these were previously thought to belong to another era. It is believed that it should be possible to find archaeological evidence as the Battle of Barnet was the earliest battle to use artillery on a large scale, making it historically significant. We know that the Yorkist troops advanced under cover of darkness so close to their Lancastrian counterpart that the artillery bombardment from Warwick’s troops just passed over the heads of Edward’s troops. Within the new area there is little development although suburban expansion is encroaching in the eastern and southern sides. Much of this land was within Enfield Chase in 1471 and would have been open heath and common at the time of the battle. Today it is fully enclosed agricultural land and parkland and fairly inaccessible for the curious sightseer. However, the Battlefields Trust is holding a historical walk of the area on 12 April in order to raise money. NOTES: The manuscript with the above picture is at the Musée Dobrée in Nantes. The picture can be found here. For more information have a look at the very informative website of the UK Battlefields Resource Centre or read an article from the Times. The maps on the Battlefields website are of particular interest as they show the two different sites. This entry was posted on Thursday, March 18th, 2010 at 0:01	and is filed under News. You can follow any responses to this entry through the RSS 2.0 feed. You can leave a response, or trackback from your own site.